Currently, if you buy a Mercedes-AMG model, you can get it in the 43, 45, 63 or 65 trims. But by as early as next year, Mercedes could be adding another engine to the AMG lineup. An inline-six one. Coming up soon is the most desirable new I6: is the ‘M256' code gasoline engine. This one is not one of the debut engines for the new S Class but Mercedes says it’s coming soon. It’s the same 3.0 liter displacement, but it’s a gasoline engine with an electric turbo, which spins with the assistance of an electric motor. That should kill turbo lag, Mercedes argues. The new Mercedes-AMG CLS53 is expected to be the first in a new line of AMG 53 models. It likely will be powered by a high-performance version of the company’s new inline six-cylinder engine codenamed M256. The engine reportedly will produce 430 hp in the CLS53, but it also will be paired with an electric motor in a hybrid setup that boosts the car’s overall power even higher while improving efficiency. 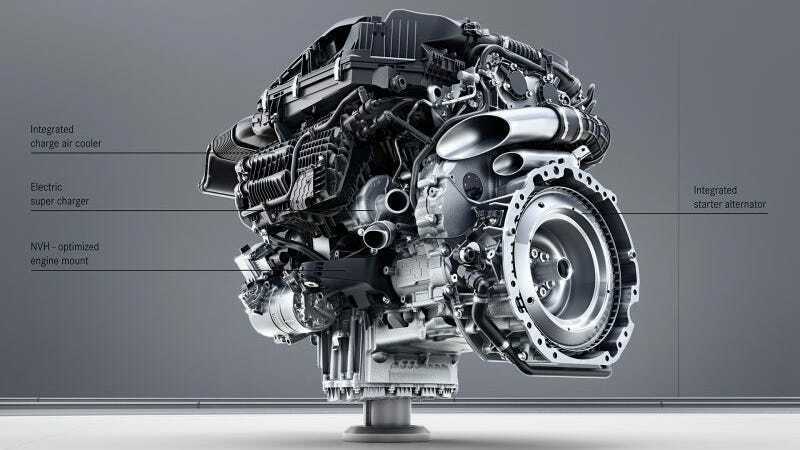 If the AMG 53 engine will indeed have a 3.0-liter displacement, then it would seem that the 3.0-liter V6 in the 43 models would become redundant. Mercedes might replace the 43s with the 53s. Personally, I don’t think the 4.0-liter V8 twin-turbo, the 5.5-liter V8 twin-turbo, or the 6.0-liter V12 twin-turbo are going anywhere anytime soon. There would be riots. When emailed for comment, an AMG spokesperson declined to comment.